Bright Coop, Inc. is the authorized dealer for Viking Specialized Turkey Trailers. Standard coop sections are made in four, eight, and sixteen foot lengths, six coops high with other configurations available. Coops are Hot Dipped in Prime Western Zinc for a corrosion resistant galvanized finish. We offer coops with or without a center aisle air space. Coop floors and roof material are made from a hand laid woven fiberglass. Coops feature our “Big Tom” door which when opened for loading and unloading rests against the floor joist of the coop above it. Coops are attached to the trailer using a “Floating” mount method. A standard load of coops (144) is designed to fit on a 48′ trailer. We can accommodate shorter load lengths and lengths up to 53′ as well as special coop configurations. Tube uprights are 2″ x 1″ tubing while the horizontal members are 1″ x 1″ tubing. All tubing wall thicknesses are .120 (11 gauge) for strength and durability. Floors are supported by two 1″ x 1″ tubes and two 1/8″ x 1″ straps. Our partitions are heavy duty gauge wire with four larger horizontal rods for added strength and durability. Coops are fitted with “Big Tom” (slip link) doors with our “Easy Flip Latch.” This latch keeps the door at maximum door opening height during loading and unloading of turkeys. Swing out doors are available. Coops are floored with green hand-laid woven fiberglass floors. These floors are secured by wide angle hold downs in addition to stainless steel rivets in the doorway. 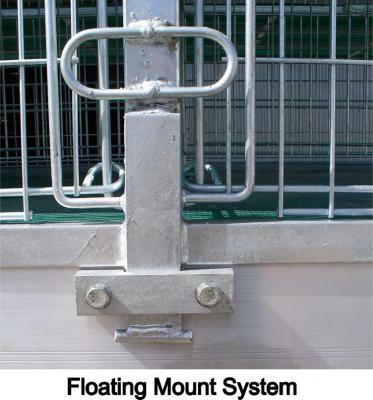 Galvanized door flashing in the doorway is also an option and prevents wear from loading and unloading. There is an option to not floor the bottom coop, wherein, the trailer floor be covered with a one piece green hand-laid woven fiberglass trailer cover to prevent corrosion of the trailer and for ease of cleaning and disinfecting. The trailer is also floored with a stripped pine floor. Full floor is optional. White Kemlite is also an option to the green fiberglass. Loads are available in 4′, 8′, and 16′ sections. These sections can be five, six or seven floors high. Coop headspace depends on the number of floors per section. A five high section has 19-1/8″ of headspace. A six high section has 16-7/8″ of headspace, and a seven high section has a headspace of 14-5/8″. The 4′, 8′ and 16′ sections can be painted or galvanized. Galvanized coops are “Hot Dipped” in “Prime Western Zinc” to protect against corrosion. Painted coops are shot blasted to bare metal, primed with rust inhibitor and painted. We offer two different options for winterizing. We recommend full weather panels and weather rods for maximum protection. Also offered are individual weather panels that are smaller and attach to each door with a weather panel retaining kit. These panels are available in green hand-laid woven fiberglass or the white Kemlite panel. Coops are mounted to the trailer using our “Floating Mount System” to relieve stress and promote flex in the cage. This stress relief prevents cracking of the welds or tubing. Rigid mounting is optional.